Specialty Dump Bodies | Crysteel Manufacturing, Inc. Strength and functionality... 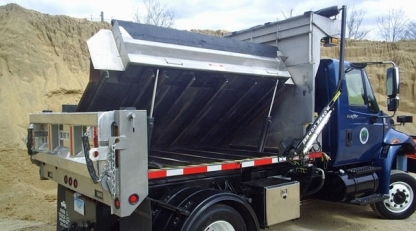 The all-season Sidewinder operates as a traditional dump body and provides a solution for spreading material during the winter months; able to spread sand or salt up to 25 feet with continuous feed from the body. 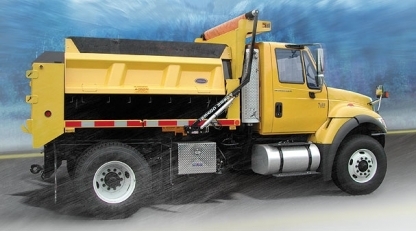 With DuraClass' patented body sidewall construction, heavy-duty box braced tailgate, full depth corner posts with additional support added to the right rear post and continuous 100% welding on the body, the Sidewinder is the most durable, dependable and versatile body built for municipalities and contractors. With its compact size the 3-4 yard Sidewinder Jr, designed for medium duty truck applications, has increased maneuverability on narrow roads and metro areas, while minimizing clearance concerns. The 5-14 yard Sidewinder was designed for 12 months of demanding work. From snow and ice control to demolition to hauling pea gravel for summer chip spreading this versatile and durable body has no peer.